This large and popular market, situated in the Plaza del Cristo in the centre of the historic city of La Laguna, is established to promote and sell all the local produce of the farmers of the area. Thus, you'll find copious supplies of fresh fruit and vegetables, fish and meat. Customers are encouraged to sample the wares as well. Noteworthy is the magnificent flower display, which you encounter as you enter. A new addition to the market is a small annex of shops, selling various consumer goods. Thus, you'll find copious supplies of fresh fruit and vegetables, fish and meat. Customers are encouraged to sample the wares as well. Noteworthy is the magnificent flower display, which you encounter as you enter. A new addition to the market is a small annex of shops, selling various consumer goods. As if that wasn't enough, there is a special agricultural market every Tuesday, Thursday and Saturday. 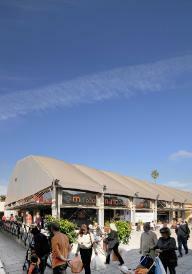 The original market was situated in Plaza del Adelantado and was in a serious state of disrepair. It was decided to demolish this building and move the market to its present location. It consists, these days, of two large marquees and all the traders' stalls have been equipped with hot and cold water, an electricity supply and a phone line. It has ample carparking facilites, plus local public transport connections. There is also a "train" travelling to it from Avenida de La Trinidad, which is free. All told, there are in excess of 100 businesses operating out of this market, so there is sure to be something for everyone!